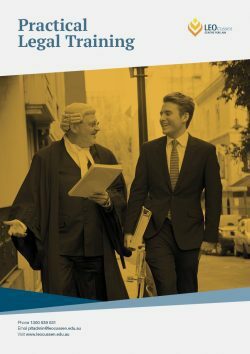 Leo Cussen Centre for Law offers a course of practical legal training for LLB graduates (or equivalent) leading to admission to the legal profession as an Australian Lawyer. This training can be undertaken either as ‘supervised legal training’ known as Traineeships (VIC), or in a course such as the Leo Cussen Practical Legal Training Course. The Leo Cussen Centre for Law PLT course, leading to the Graduate Diploma in Legal Practice, is approved by the Victorian Legal Admissions Board and the Legal Practice Board of WA, and is recognised by the legal profession as providing comprehensive and quality training. The course is delivered in both an onsite and online (blended learning) mode. The online course is also offered part-time. Next course starts in July 2019! Vic Onsite – 21 weeks of formal training, 9am-5pm, Mon-Fri, and three weeks’ professional placement; two courses per year. Vic Online full time – 21 weeks of formal training, including 13 days face-to-face onsite, and three weeks’ professional placement. Two courses per year. WA Online full time – 21 weeks of formal training, which includes 13 days of onsite and intensive, face-to-face sessions. 9 weeks of professional placement (if exempted from the Career and Profession Ready Module). Two courses per year. Vic Online part-time – same course structure as online but runs for 42 weeks, including 18 days face-to-face onsite, and three weeks’ professional placement. On this page you will find detailed information specific to our PLT courses, including eligibility, attendance obligations, selection criteria, vital dates, fee information and much more. After all, what do we think makes us special that you should choose Leo Cussen? Leo Cussen’s mission is to provide comprehensive and quality practical training to law graduates leading to their admission to the legal profession as Australian lawyers. PLT acts as a bridge between academic learning and legal practice. PLT should have its emphasis in learning by doing and the development of practical skills in the context of matters and situations that will be encountered in legal practice. PLT should integrate the teaching of skills, ethics, substance, practice and procedure in the context of a series of simulated files that are based on routine transactions. PLT should approximate the reality of practice to the fullest extent practicable.